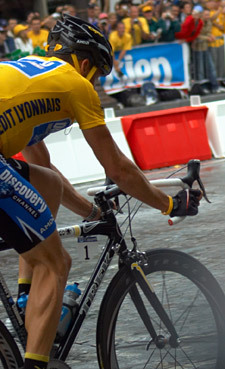 We specifically timed our visit to Paris so that it coincided with the end of the Tour de France. Every year, the last stage of this famous month-long bicycle race finishes in Paris with the riders doing several laps around the Champs d’Elysée, an extremely long double-wide street that runs from the Arc de Triomphe to the Louvre (it also has a lot of high-end shopping on it, if you have the cash). For the weeks prior in Portugal, we diligently caught as many race stages on TV as we could so that we’d be up-to-date. We had visions of sitting in Paris cafes with the locals all cheering and jeering the riders as the drama of the remaining stages unfolded live on television. (This, indeed, did happen quite frequently in Portugal.) But alas, when we tried to find such a place in Paris, we discovered that they’d rather watch rugby, or for that matter, anything but the Tour. The fact is that this year there are very few strong French riders, and the whole Lance Armstrong dynasty is getting a bit old. So we briefly considered heading out of the city to try and catch a few stages live, but decided that it was just too much trouble; instead, we’d take in Paris by day and catch up on the Tour on TV at night. On the last day of the Tour, we got up early and braved the rain to secure ourselves a front row position on the Champs d’Elysée to watch the conclusion of the final stage. Usually by this time, the winner of the Tour is already decided, and indeed it is going to be Lance again, but there is always a sprint finish to claim the special glory of winning the last stage. There are a lot of Americans here. And all sorts of Europeans, and surprise surprise, even a few French. It is quite an event, with updates (in French, of course) blasting out of various speakers providing race updates as the riders make their way across the countryside towards Paris. You can even watch the stage unfold on a huge-screen TV, but we elected to skip the TV in favor of our front-row vantage point. After what seems an eternity (really it was only about 5 hours), the riders start zooming by. It is exhilarating to watch all the colored jerseys (including Lance in yellow) fly by as the riders somehow manage to stay on the one-foot-wide strip of flat pavement at the very edge of the road (the rest of the width is cobblestone, so riding there is a bit trickier). Fortunately they do eight laps. Otherwise the experience would be frustratingly brief. Even with eight laps, it’s pretty difficult to figure out what is going on since the riders are not all on the same lap and they really are moving pretty darn fast. It turns out to be a dramatic and unexpected finish with Alexander Vinokourov from T-Mobile winning the stage, though we can’t really see it happen since we’re not at the finish line, so we’ll watch it again on TV tonight!